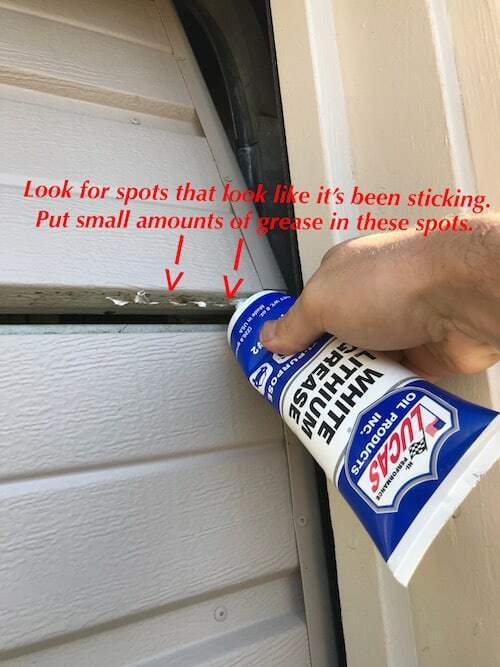 A couple things to think about before or after you’ve painted your garage door. First off there are a couple suggestions we have for you in case you decide to change the look of your house. Painting your door can make it or break it in terms of styling your home. It’s usually best to stick to neutral colors as those will be the least noticeable. The garage door makes up about 25-50% of the face of your house so painting it the wrong color can seriously hurt how people see your home. Obviously it’s your decision and you know what’s best for your own home but we do recommend taking it back a notch if you’re really planning something drastic. If you ever plan to sell this is what people will see first most of the time. Keep that in mind as you go about choosing a color that fits your taste. As for doing the deed itself, you can either do it on your own or hire a painter to do it for you. Deciding to do it yourself? No worries! You can check out this blog post by Barabara where she goes into detail on doing the entire project! We got her permission to use some of the photos in her blog post for our article. Thank you Barbara! In our opinion the best method would be to spray the door but you can brush it if you choose to. With both methods there are pros and cons. Spraying your door may go by faster but you may have to do a couple of coats. You’ll also need to do quite a bit of prep work but it can be done with the door closed. Whereas brushing the door you’ll probably be okay with one coat as more paint is distributed with a brush. If you’re going the brush route you can do it a single panel at a time. Doing it this way you can cover spots that you wouldn’t be able to if the door were down. Do this one panel at a time, giving each layer time to dry before moving on to the next. That’s really all there is to know about painting your door. 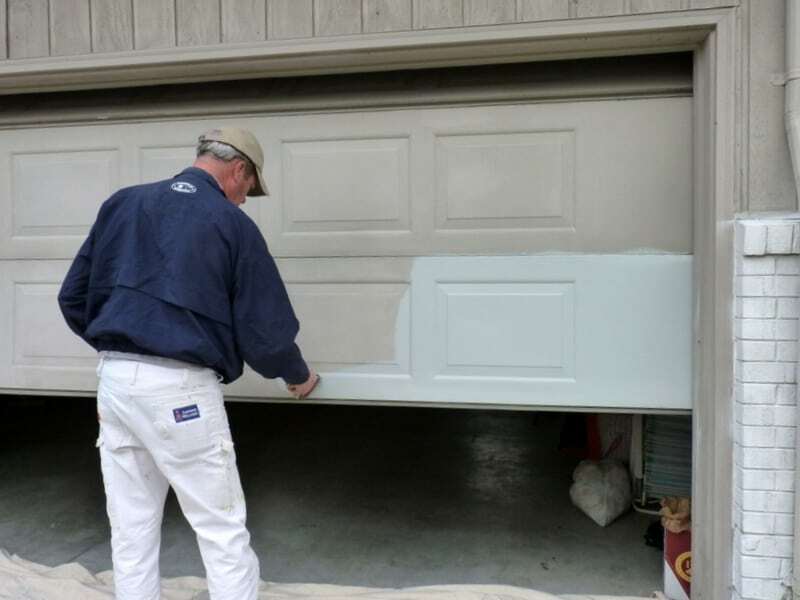 Why Write An Article On Painting Your Garage Door? Now onto the reason for this particular post. 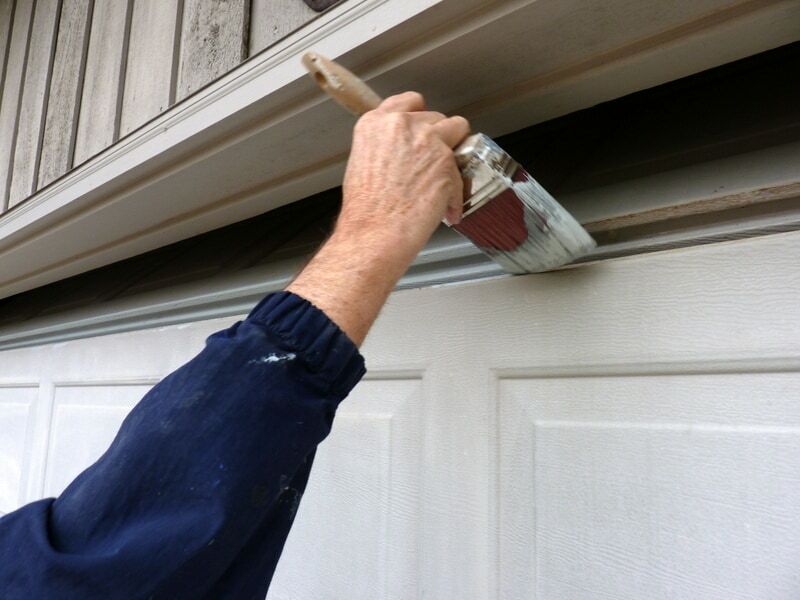 We have had many instances of an issue arising when painting the garage door and the trim around it. This prompting us to post this article. 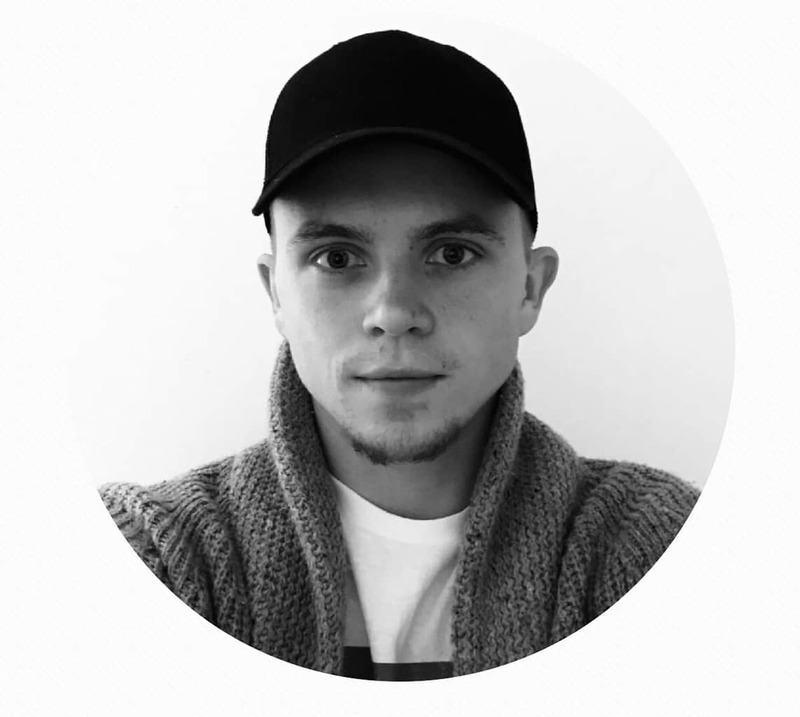 We hope to inform you of a solution to an issue you may or may not have seen yet. Well when you paint it with a brush or spray, the paint will get everywhere. Including where the panels separate. The grooves in other words. You may not notice it the first day but once the door has time to sit, usually when it’s closed for a couple hours or over-night. The paint will stick to itself in those grooves. You wake up in the morning and start your day of as usual. Good cup of joe and out the door you go. You hit the garage door button expecting it to open without a problem as usual. Then all of a sudden you hear a nasty popping sound as if the door is coming off the tracks. Once, twice, three times or even four. The amount of times varies depending on how many panels you’ve got. Essentially the panels get stuck together and as you open it you’ll hear the dry and stuck paint unsticking creating that popping sound. It’s very annoying and people pay garage door companies to come out and fix it. When all it really takes is a rag and some clean grease. The grease we’ve used in the past can be found here. ISSUE 1: What you want to do is put grease inside the grooves so that the paint won’t stick any more. Put small amounts all the way down the panels, yeah we know it’s a hassle but 10 minutes of well to do can save you 25-100$ dollars by not calling someone to do it for you. It’s a tried and true solution. Remove any excess with a rag and be sure to put very small amounts so it doesn’t drip or come out to the fresh paint. Looks good after all why not keep it that way. Congratulations you’ve saved yourself a service call and possible unpleasant experience with a nasty garage door technician. Some of them might even try to sell you things you don’t need. Don’t fall for it. ISSUE 2: The next issue you have has more to do with the trim itself. Now if you have wood or metal trim it doesn’t make a difference if you paint it or not. 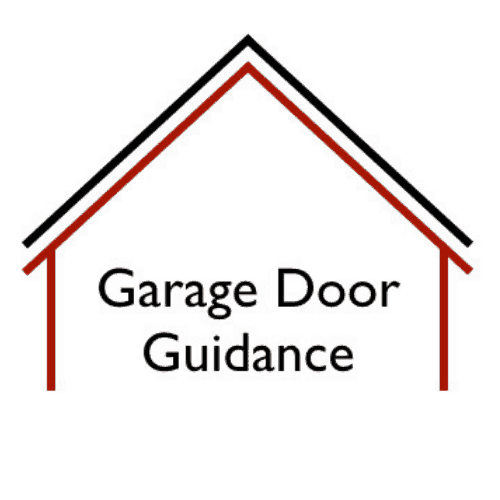 The real problem is if you’ve got the vinyl weather seal that garage door guys will sometimes put on should you need it. The thing with vinyl trim, it’s not made to handle paint. If you do end up painting it you will undoubtedly end up having to replace it. The paint with vinyl will cause shrinkage with the weather changes of summer and winter. We’ve seen this time and again. It will shrink sooner or later and will warp.. It’ll mess up your nice paint job and cost you more money in the long run. Choose the color vinyl you need/want with your installer and leave it alone. They aren’t usually cheap. To sum it all up you don’t want to paint vinyl weather seal, and you don’t want to layer your paint coats on too thick. 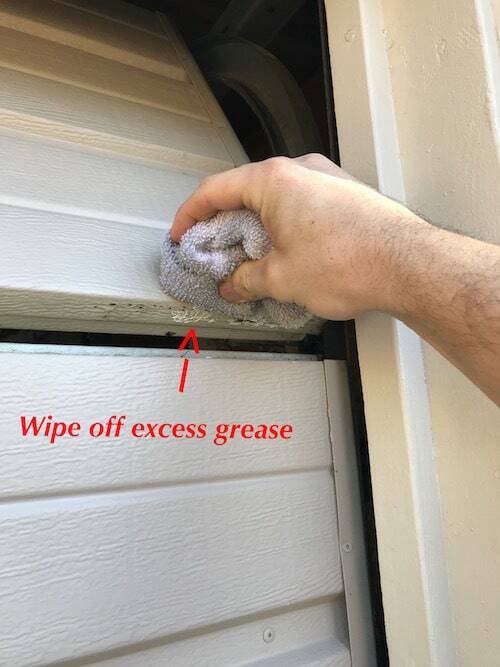 If you do, lubricating the creases will be required to rid yourself of annoying garage Door sounds. Like and share this article with your friends and leave a comment if you found this helpful!